To ensure that every cat is given the chance of a life where it will be treated with kindess and understanding of its needs. 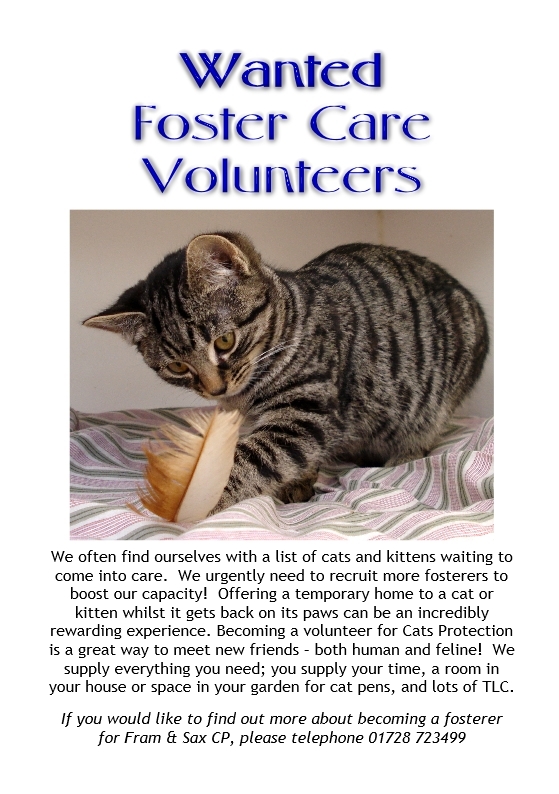 Framlingham & Saxmundham CP rehomes between 150 and 200 cats and kittens every year! We have a dedicated group of fosterers, who maintain cat pens in their gardens or have a dedicated room in their homes and give their time unconditionally to the rehabilitation and care of all the stray and unwanted cats and kittens that pass through our branch. We run regular neutering campaigns where we offer free neutering to people on low incomes and Income Support. We neuter feral cats and help feed colonies on a regular basis. We offer advice to the public on the care of cats and kittens and have an extensive range of leaflets about all aspects of cats, care and ailments. We give educational talks to local groups such as Brownies, Scouts and Guides. Please let us know if you would like us to come along to one of your similar groups. We attend fundraising events throughout the year, the Suffolk Show being our largest; other events include local fairs, fetes and supermarket collections. The stalls are run by our dedicated band of volunteers. If you would like to join us, even for an hour or two to help out, you would be very welcome. We run a sponsorship scheme for "special needs" cats who have to stay in our care for many years due to ongoing health problems. More information on our Feature Page. We run a Lost and Found register.